Innovation Club is a series of events, where professionals with similar interests and focus meet up to socialize, discuss and share trends and novelties on current hot topics. The first workshop was organized by the Swedish trade and Invest Council Business Sweden, the Swedish Chamber of Commerce in Hungary and was sponsored by Ericsson, Electrolux and Sigma. The first keynote speech was held by Elena Osichkina, manager of the design department at Sigma Software. In her presentation, she named the user as the only person who really knows what a good design is, and gave some every-day, yet powerful examples of it. Ms. Osichkina’s speech was followed by the panel discussion, where usability experts shared their ideas about the topic, bringing examples from their respective industries. The session ended with an interactive game. Participants divided into the teams bent to the task of designing the dashboard of a car. The jury evaluated the solutions and selected the winner. After the break, Mr. Janne Irmola, Chief Product Owner, Ericsson R&D, shared his thoughts on telecommunications trends, ways of working and results. The panel discussion following his presentation received numerous questions, proving that the ideas presented matched well with the interests and expectations of the audience. Then Vladimir Beck, Board Member at Sigma Software, made a surprise presentation about the custom-made motorbike designed by his team and himself. The motorbike has won prestigious prizes at design competitions both in Europe and around the world. “I believe it was a fruitful event with interesting and topical presentations, in friendly atmosphere, and with the audience keen to network and learn. 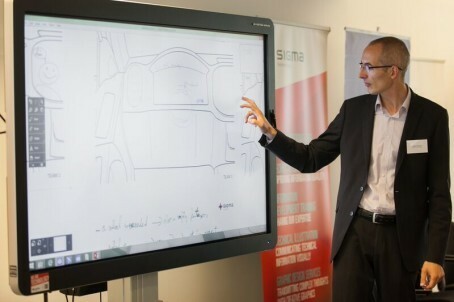 The next meetings will be announced later, I do hope that they will be no less successful,” shares György Nagy, Country Manager of Sigma Technology Hungary. The next workshop is planned for September. Stay tuned for more updates coming on our website http://www.sigmatechnology.se.